The «AT-X» in the series name stands for «Advanced Technology-X», featuring high-performance lenses that realize high specs, functionality and ergonomic operability. The Tokina AT-X 107 DX is a fish-eye lens that gives the digital photographer an approximate 180° field of view with dramatic curvature of field or «fish-eye» effect. With this lens an entire view or vista can be captured, wider than the human eye can see. The AT-X 107 opens an entirely new dimension of photography. Unlike other fish-lenses, the AT-X 107 DX gives a full corner-to-corner image. The front element of the AT-X 107 DX has a newly formulated WR or “Water Repellent» optical coating on the glass. This coating makes marks such as spots left by water or finger-prints much easier to clean than standard multi-coating. The rear optical group of the lens contains 1 SD (Super-Low Dispersion) glass element to reduce the number of elements (pieces of glass) in the optical design in order to make the lens more compact, light-weight and faster focusing. Note 1: This lens is designed to work with cameras that have an APS-C sized sensor only. Note 2: Autofocus with this lens is not supported with Nikon DSLRs that do not have a focus motor in the camera body. Note 3: The model for Canon has onbody AF/MF modes switch. 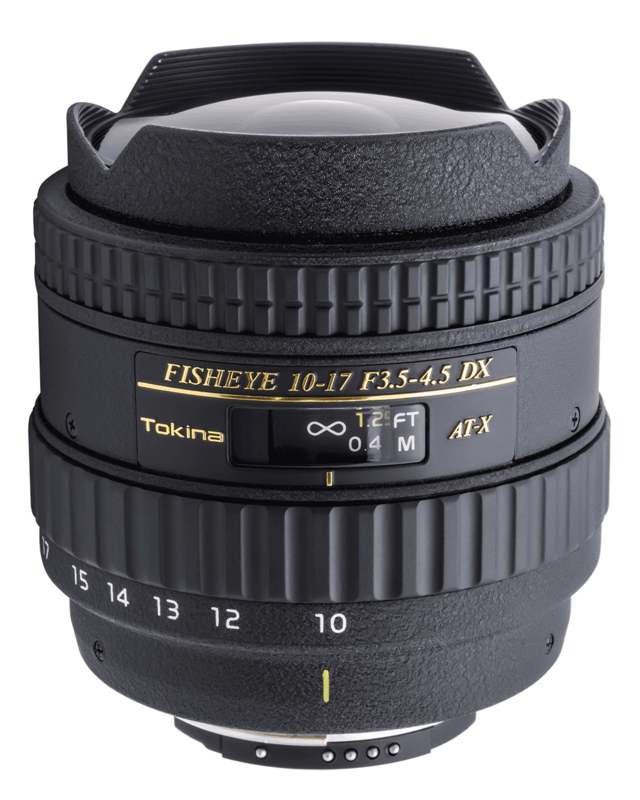 The Tokina AT-X 107 NH is a fish-eye lens that gives the digital photographer an approximate 180° field of view with dramatic curvature of field or «fish-eye» effect. The AT-X 107 NH only differs from the AT-X 107 DX in that the built-in hood as been removed allowing for a wider image area and more coverage on full-frame sensor (FX) cameras. Note 1: Full corner to corner image can be achieved on an FX camera between approx. 14.5-17mm depending on the camera model, at 10-14mm there is a semi-circular view.